When people first walk into our home, there’s one thing they usually say. “Oh, it smells good!” With an indoor dog, kids, kids’ friends, two parents who regularly exercise and just every day life, a home can get pretty smelly. (Not to mention the times a cooking project goes bad…sigh.) I can’t mop the floors every day (well I could, but I don’t) or vacuum everyday. So, I need something to help out in between cleanings. How does our home smell so great? It’s my secret weapon. 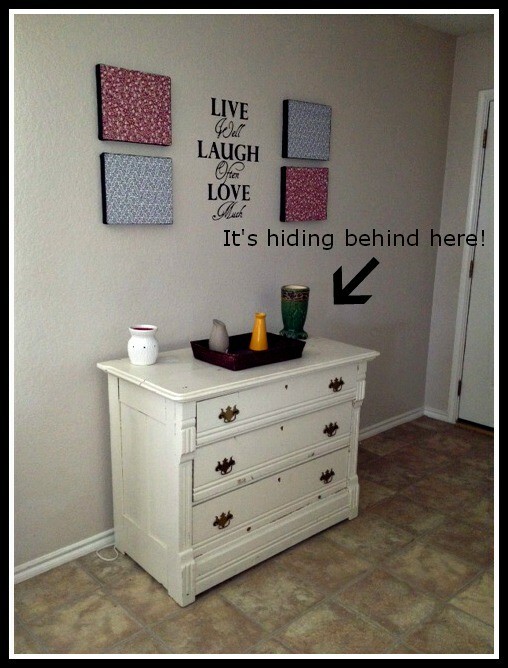 I have an Air Wick scented oil dispenser right behind this dresser in our entry way. Not only are the guests greeted with an amazing smell, but so are we when we arrive home. There’s something about walking into your house and it smelling great that is relaxing. Even if I know there are piles of laundry to be done, floors to be cleaned and furniture to be dusted. I recently had the opportunity to try out the Air Wicks National Park Limited Edition Collection. I received a candle in Denali and a scented oils pack with four different scents. The candles retail for $4.99 and the scented oil packs for $5.99. Air Wick® just partnered with the National Park Foundation (NPF) to craft fragrances that capture the rare essence of our national parks. Our fragrance experts spent thousands of hours and went through countless combinations of notes to find the perfect scent. Now, you can find yourself in the Grand Canyon or Denali with the new limited edition collection. Air Wick Scented Candles fill the room with luxurious fragrances, creating the perfect ambience for your home. Lasting up to 25 hours, each contains rich essential oils and come in a beautiful frosted glass container to add a special touch to any room. I not only love the way the candle smells, but the frosted glass container is beautiful. 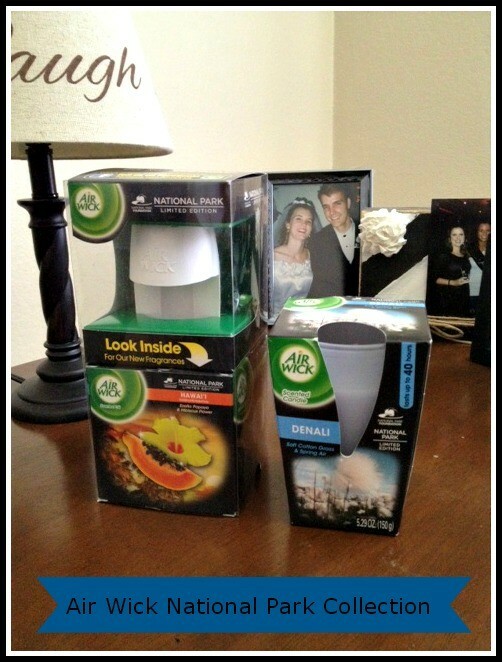 Air Wick scented oils are available in warmers, nite light warmers and double fresh warmers. Grand Canyon — be awestruck by the breathtaking majesty of the Grand Canyon then discover the subtle floral notes of delicate cactus blossoms carried on the warm summer breeze. Virgin Islands — find yourself in the idyllic paradise of Virgin Islands National Park and uncover the delightful notes of tropical plumeria & sweet honeysuckle. Gulf Islands — bask in the fragrant scents that take you to the Gulf Islands, rich in white sand beaches and seashores that evoke sun-drenched sweet notes of a tropical paradise. American Samoa — explore the lush paradise of American Samoa National Park to finally reach the sweet refreshing notes of native coconut & island palms. Denali — seek renewal in the sun-drenched valleys of Denali National Park while breathing in the clean notes of pure cotton grass & fresh spring air. Hawai’i — escape to a tropical island sunset in Hawai’i Kaloko – Honokohau National Historical Park and savor the unspoiled notes of exotic papaya and hibiscus flower. The National Park Collection is available in Air Wick’s full range of products that retail from $2.99 – $5.99 and includes Scented Oils, Freshmatic Auto Spray Refills, Scented Candles and Reed Diffusers. Air Wick is a proud supporter of the National Park Foundation, the official charity of America’s national parks. Available at all major retailers. My favorite scent is Hawai’i. It just smells amazing. Do you have any secrets to making your home smell good all of the time? Do you use candles and scented oils in your home?